GRIP is the local Retro for Master Builders Association (MBA) members, serving 1,000 companies in King, Pierce, and Snohomish counties. We help employers lower their L&I premiums, maximize Retro refunds, and handle claims effectively. In 2015, GRIP participants received over $5 million* in refunds. GRIP is already helping 1,000 member companies to reduce on-the-job injuries. If your business is committed to safety and injury prevention, then GRIP helps you earn annual L&I refunds and reduce costly business expenses associated with on-the-job injuries. GO TO MBAGRIP.COM for more information, to fill out an inquiry card, or enroll. 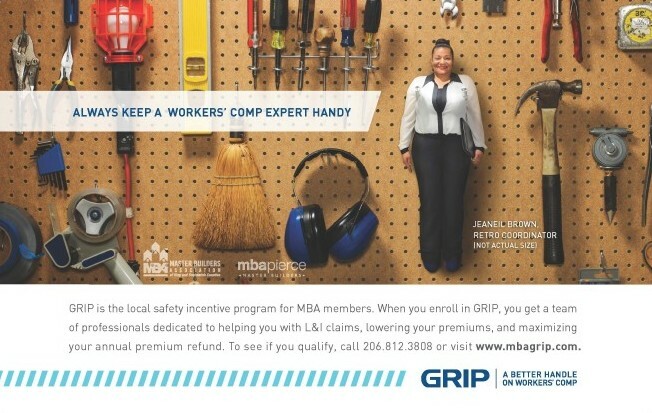 EXISTING GRIP PARTICIPANTS: GO TO MBAGRIP.COM TO FILE AN ACCIDENT REPORT, SCHEDULE A SAFETY VISIT OR SCHEDULE A CLAIMS 101 CLASS.